Whereas 'Wiener Schnitzel' has to be made of veal, Schnitzel Viennese Style can be made out of pork chops (Schweineschnitzel), turkey cuttlets (Putenschnitzel) or chicken breast (Hähnchenschnitzel). More often you will find "Schweineschnitzel", "Putenschnitzel" or "Hähnchenschnitzel" on the menu in a German restaurant but sometiemes the more generic name 'Schnitzel Wiener Art' is used. In the event you have any dietary restrictions ask what type of Schnitzel it is. Rinse the pork chops or chicken breast in cold water then dry with paper towels. 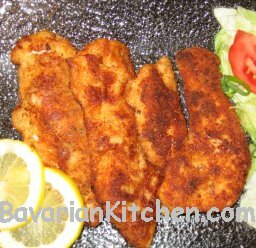 Tenderize the pork chops on both sides evenly with a meat mallet or if you are using chicken, cut the chicken breast in half (to make them thinner) this will give you four Schnitzels. The whole chicken breast would be to thick to fry perhaps not completely cooking in the middle. We have to cook poultry completely through for health reasons. You don't have to tenderize the chicken breasts. Season with salt and pepper on both sides. Prepare three dishes: 6 tablespoons flour in first dish, whisked egg with 1 tablespoon water and 1/2 tablespoons oil (or 1 tablespoon buttermilk or milk) in the second dish and 6-8 tablespoons bread crumbs in the third dish. Coat the meat with the flour on both sides, shake off any excess, dip in the egg mixture on both sides and lastly into the bread crumbs shaking off any excess. Prepare a stainless steel or cast-iron skillet with little canola oil to cover the bottom of the skillet and let it get hot on high heat. Drop in a few bread crumbs and if the oil sizzles around them it's hot. Reduce heat to medium. Fry meat until golden brown turning once. Do not cover the skilled. Garnish with lemon slices and parsley. Serve with rice, french fries, mashed/boiled potatoes, steamed vegetables or a garden salad. Like this recipe? Have a point of view to share? Let us know!